At Egham Dental Care in Old Windsor, we are committed to quality. This starts from the moment you enter the premises through to the technical quality of the treatment that you receive and onto the experience after you leave. The ambience has been thoughtfully created to convey a calm and friendly atmosphere. This is aided by the welcoming nature of the staff at our practice. All equipment is either totally disposable between patients or undergoes a rigorous multi-stage disinfection/sterilisation process. This starts with a thorough debridement in an ultrasonic bath and each instrument is individually heat sealed in a sterilising pouch. The equipment is then sterilised in a triple vacuum autoclave. The end result is that the patient can be sure that the instruments that will be used during their treatment have not been contaminated by even the air in the room, let alone anything harmful. The body known as the CQC (Care Quality Commision) regulates and inspects all health related premises ranging from care homes for the elderly to hospitals and dental surgeries. We have been assessed by the CQC and have met all of the standards that are required. We are comfortable to discuss any aspect of our quality with our patients. 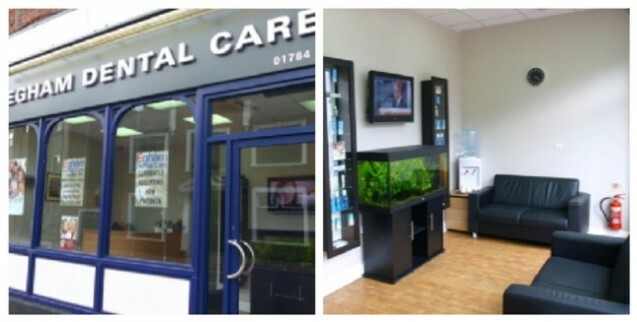 Our dentists serve clients from Old Windsor, Windsor, Egham and surrounding areas. If there’s anything that concerns you or if you’re just curious, please feel free to ask one of the team. Call us now on 01784472444 to request an appointment. As well as emotional support and advice; We offer a wide range of services to help nervous patients feel relaxed during their treatment. Dr. Jatin Patel is Dental Phobia Certified.